Destination Hakuba is your independent Hakuba Travel and Hakuba Accommodation guide. See more about us here. Hakuba Village in Nagano, Japan is one of Japan’s most popular ski areas and host of the 1998 Olympic Downhill. Hakuba receives approximately 11 meters of snowfall annually, with most snowfall occurring in the months of January and February. The area of present-day Hakuba was part of ancient Shinano Province and was part of the territory controlled by Matsumoto Domain under the Tokugawa shogunate of the Edo period. Hakuba was once part of the route called the Salt Road used to bring salt and other marine products from the coast at Itoigawa in Echigo Province (now Niigata Prefecture). The Hakuba Valley is home to nine resorts, including 135 lifts (inc. 5 gondolas) accessing over 200 runs that offer an expanse of terrain and at least 9 terrain parks. There are 960 hectares of skiable terrain which equates to 137km of piste. Skiing offers Hakuba is varied across the resorts but it’s generally very well suited to beginners and intermediates with many long perfectly groomed runs and fantastic fall-line. There’s also some world class back country skiing on offer. 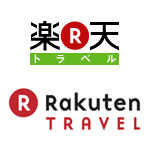 Search Hakuba Accommodation & Hakuba Hotels with our valued partners – get instant confirmation! Hakuba Village itself consists of several main ski areas and these are broken into sub-areas. The Hakuba ski resorts aren’t interconnected via the slopes (except for Hakuba 47 and Goryu, and Cortina and Norikura), but they can be accessed off a common lift ticket and there are free shuttle buses to get around to the different ski areas. At the southern end of the Hakuba Valley are the resorts of Goryū, Hakuba 47, Sun Alpina, Yanaba, Minekata and the Olympic ski resort Happōone (pronounced Happ-o-ney). To the north are the resorts of Iwatake, Tsugaike Kogen, Norikura, and Cortina. 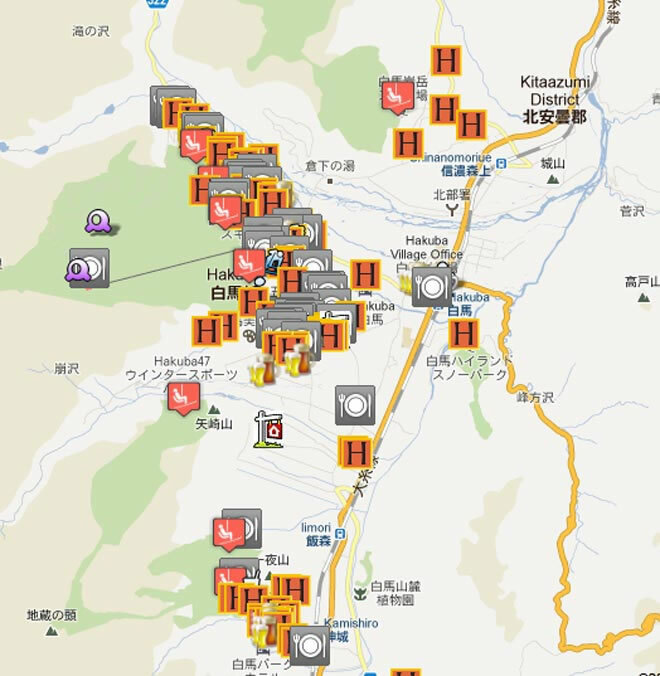 Also check out our Hakuba Maps Guide or Hakuba Google Map which provides a wide variety of information about Hakuba accommodation, restaurants, bars transport, webcams and ski resorts. Our Hakuba weather and snow forecast can be found here, our Hakuba Access Guide is here and Hakuba onsen Information here. Getting to Hakuba is super easy. 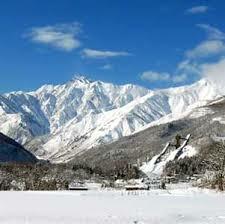 The Hakuba Valley is located north-west of Tokyo 60 minutes from Nagano City. See our comprehensive directions to Hakuba here. For medium-large groups we can help organise a direct shuttle from the airport or other resorts, whilst shared shuttles are available for individuals. Hakuba Village offers hundreds of ryokan, pensions, ski lodges, hostels, self contained apartments and other Hakuba accommodation styles. The Destination Hakuba Accommodation Guide offers a huge range of over 200 Hakuba hotels & resorts, budget hostels & backpacker accommodation, pension, ski lodges, ryokan & traditional inns, ski in ski out, and luxury accommodation to help find the best place to stay in Hakuba. These range from those with the most basic of facilties to luxurious, from Japanese style to faux-European. So there will always be a number of Hakuba accommodation options to suit both your style and budget. 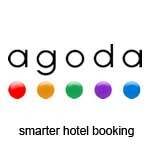 Search and book the largest listing of Hakuba Accommodation options online and get instant confirmation! Hakuba is a dream location for skiers seeking cheap Hakuba accommodation. Some establishments such as K’s House Hakuba Alps and Hakuba Alps Backpackers are purely backpacker style. 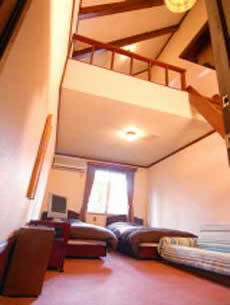 The Phat House is located 750 m from Iwatake Ski Resort Gondola with in-house bar and restaurant. Mt Hakuba Backpackers Hostel is conveniently located in Echoland within walking distance to entertainment options and shuttle bus stops. Share and Guest House Hakuba offers simple dormitory-style accommodations with free Wi-Fi. Hakuba Cortina Backpackers is only ten minutes from Hakuba Cortina and offers a range of options including dormitory room, standard Western-style room or a Japanese-style room. 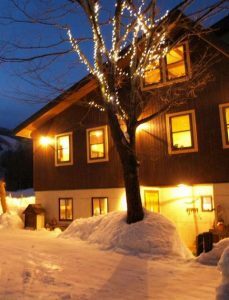 Little Alaskan Guesthouse in Hakuba is situated 3.8 km from Hakuba Iwatake Ski Area. 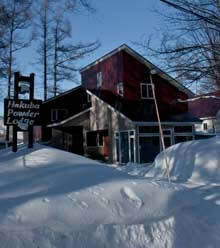 See more Hakuba budget accommodation here. Located in the village of Happo and only a 4-minute walk from Happo One Ski Resort, Bluebird Apartments features modern rooms with free Wi-Fi and floor to ceiling views of the Northern Alps. Open in 2017, Avanti Chalet offers self-catering accommodation with Apple TV and Netflix plus a kitchen equipped with induction cookers, grill, microwave, dishwasher and oven. Ideally located a 5-minute walk from Happo One Ski Resort in Hakuba, Alps View Chalet provides cosy 3-bedroom accommodation with a fully-equipped kitchen, a lounge with high ceiling and 2 bathrooms. Boasting mountain views, Fuku Chalet is set around 2.3 km from Hakuba Iwatake Ski Area. Located 2km Happo One Ski Resort, Kitsune Cottages have a dining area and a kitchen fitted with a dishwasher, an oven, and a microwave. With only five minute walk to Happo-one Ski Resort, Gakuto Villas offers modern self-contained accommodation with a fully equipped kitchen, a flat-screen TV and free Wi-Fi. Nestled just 200 metres from the Hakuba 47 Ski Resort gondolas, Wasabi Mountainside Chalets offers ski slope views free WiFi access throughout the entire property. See more Hakuba self-contained accommodation here. Hakuba Village offers dozens of pensions, ski lodges, villas and B&B. These range from those with the most basic of facilties to luxurious, from Japanese style to faux-European. So there will always be a number of accommodation options to suit both your style and budget. Very popular with foreign skiers is Hakuba Pension Meteor a.k.a. Lodge Meteor which is a long standing local Hakuba pension, owned by a local family for two generations. Also popular is Alupu Lodge right on the base of Happo-One and Grove Inn Skala featuring a cosy lounge with a library, a bar and a wood-burning stove. Looking to get right on the slopes? Alupu Lodge is well located right on the base of the Hakuba ski slopes, Penke Panke Lodge is conveniently located next to the Sakka High speed quad at Happoone, whilst Wind Jacket Lodge is only 250 metres from the Happo One ski lift as well the Hakuba night life. Hotel Petite Hamac is a 5-minute walk from Hakuba Happo One Ski Resort. Imagine skiing deep Japanese powder snow then coming ‘home’ to rich cultural experience along with a long soaking hotspring. 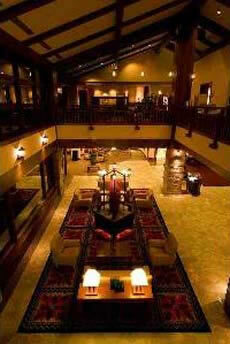 Welcome to luxury Hakuba accommodation with the many traditional style inns ready to greet you. Some are older, such as Araya Ryokan which provides cosy family-run accommodation located a 5-minute drive from Hakuba Happo One Ski Resort. Some are younger, such as Shirouma-so Ryokan which is a modern Japanese ryokan combining traditional Japanese architecture with a modern Japanese style. 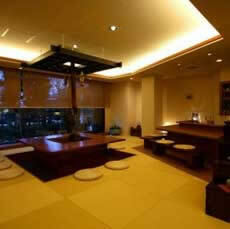 Marukin Ryokan is a Japanese-style resort hotel with a fabulous new look, yetnostalgic atmosphere. With so many Hakuba hotels and resorts to choose from how does one pick the best option? We’ve tried to simplify the choice for you by listing on our hotels and resorts page a variety of featured Hakuba accommodation properties which are some of the more popular choices for foreign skiers in Hakuba. However we do encourage visitors to be a bit adventurous and try something new. Visitors to Hakuba could do much worse than considering the Hakuba Mominoki Hotel – one of the best known hotels in Hakuba and one that is noted for its luxuriousness, location and English-speaking staff. The unique Shakespeare Hotel in Echoland has a distinctive Edwardian style that features a French/Japanese restaurant as well as a cafe/bar. Every room in the Ridge Hotel and Apartments offers guests, internet access (wireless), tv, kitchenette and balcony/terrace, whilst Hakuba Tokyu Hotel is a classic European style resort hotel offering five star luxury in formal yet comfortable guest rooms at the base of the Hakuba ski fields. Want the ultimate hot spring experience? Why not try Yamanasato Inn Hakuba Hifumi which boasts deluxe rooms with private open-air rotenburo baths. For those seeking something quieter Hakuba Goryu Hotel Stelle Belle is a resort hotel standing quietly in the woods of Hakuba but still conveniently located only three minutes walk from the Hakuba Goryu ski area. From the lobby lounge in Hotel Goryukan guests can admire a spectacular view of the majestic mountains of the Northern Alps as can one from the rooms at Rosenheim Hakuba located right next to the Hakuba Happo ski lifts. 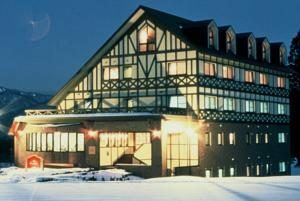 The Hakuba Alps Hotel is an authentic resort-style hotel located at the foot of grand North Alps whilst each of the 28 rooms at the 5-star La Neige Higashikan have all the comforts and conveniences of home. French cuisine made with local Nagano ingredients is served at Restaurant Jardin in the Hakuba Springs Hotel. Check out snow, ski and weather conditions around Hakuba Village, Nagano as well as the Hakuba47, Goryu, Iwatake, Happo-one, Tsugaike Kogen ski resort areas via our 26 Hakuba webcam images. These are usually updated every 20-30 minutes. Additionally these show local road conditions if you are travelling in and around the area. Most Hakuba webcams will operate around the year so you can also enjoy the Madarao green season from your office or lounge room. Check out all of our Hakuba webcams here. During the season check out all the latest Hakuba weather forecasts for Hakuba ski resorts plus Hakuba snow conditions via our Hakuba weather page. 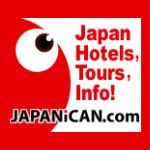 Thanks for viewing the Destination Hakuba Accommodation Guide! Find self-contained Hakuba accommodation, apartments, ryokan, places to stay, inns, ski lodges, hostels, backpackers, Hakuba hotels and more.